Florida will see a familiar face in the opening round of its postseason run. The No. 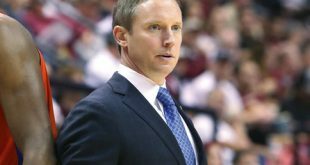 16 Florida Gators (24-6, 15-3) face off against the Florida State Seminoles (19-9, 15-3) Thursday afternoon in the first round of the NCAA Tournament. In 2016, Florida took the regular season matchup 3-1 against the Noles in Tallahassee. But, Chris Poole’s squad got the last laugh as they upset the Gators at home in the first round of the 2016 tourney. The Gators had the same 3-1 result in Tully Gym this season in their Sept. 12 contest to cap off a four-match road stint. A takeaway from the match for Mary Wise was how successful her team was in limiting a Florida State offense that entered the match averaging a hitting efficiency over .300. Junior middle blocker Rachael Kramer led the way defensively with seven blocks on the night and freshman Thayer Hall paced the team with 14 kills. Although, the Seminoles did out-dig Florida 57-43 during the match. Where Are the Noles Now? FSU enters Thursday’s match as winners in six of their last seven matches. They finished the regular season at No. 2 in the ACC standings. Over that stretch of matches, Florida State is averaging a .270 hitting percentage and 13 total team blocks. They finished second in the ACC in both of those categories. 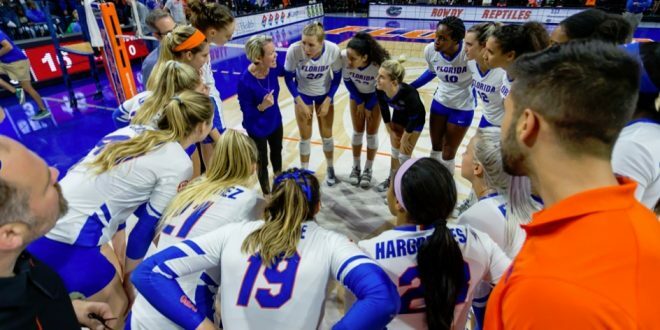 It’ll test a Gator defense that led the SEC in opponent hitting efficiency allowed (.157) during the 2018 season and a Gator offense that finished top five in hitting percentage (.256). They even boast the ACC’s Player of the Year in junior outside hitter Payton Caffrey. She joined Brianna Barry and Ashley Neff as the third player in school history to earn the honor. Her total kills and kills per set marks were tops in the ACC during 2018. Her 521.5 total points and 4.92 points per set paced the conference as well. Caffrey had the fourth-most kills in a single season by a Seminole player in school history in the rally-scoring era and her kills per set is good enough for second-most in a season. In addition, sophomore middle blocker Taryn Knuth finished second in the nation in total blocks (185) and she finishes third with 1.75 roofs per set. This match will air on UCFKnights.TV and radio coverage can be heard on ESPN 98.1/850 AM WRUF starting at 6:50. Winner will move on to play the winner of the match between UCF and FGCU.